The November meeting of the bestof Haverhill, which took place at the Days Inn Haverhill recently, focused on the importance of marketing for businesses. 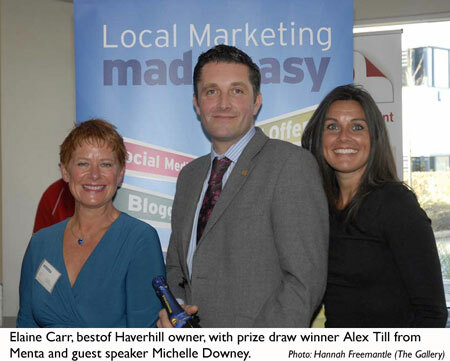 A number of bestof Haverhill business members were exhibiting at the event and were on hand to talk to local business owners about many different aspects of marketing including social media, printing and promotional goods, website design and development, branding, photography, video and outdoor media and sponsorship. Guest speaker Michelle Downey, head of thebestof, gave a presentation entitled How To Stand Out From The Crowd. In an enthusiastic and entertaining talk, which involved a high level of audience participation, Michelle asked business owners if they knew what their customers really thought of their product or service and challenged businesses to dare to be different. Michelle went on to to give some practical tips on how to stand out from other businesses. These included using professional photography in your marketing communications material; having happy employees; collecting and using testimonials; creating customer loyalty; being active on social media, using video, keeping in regular contact with your customers and buying locally. Elaine Carr, owner of the bestof Haverhill said: “What Michelle spoke about was pretty simple stuff that people could relate to but some of it was quite thought-provoking. "We all like to think we are doing a good job for our customers but unless we actually ask them how do we know for certain? "Continually questioning what we do and how we do it is really the only way to ensure that we are improving what we offer to our customers. "If a business wants to be successful today they cannot do what they have always done, times have changed. They need to be seeking ways to perfect their offer and showing their customers that they care about them. "I received a lot of positive feedback on this event, both at the meeting and afterwards via social media. A number of people commented on what an inspirational speaker Michelle is. The bestof Haverhill is joining forces with Haverhill Chamber of Commerce on December 11 to celebrate Christmas with a dinner at The Tavern in Birdbrook. If anyone would like to attend this social event contact Elaine Carr by email at haverhill@thebestof.co.uk.